I have always had a love for real estate and started my career at 18 years old. I worked in all aspects of real estate including 10 years in escrow. I am committed to providing impeccable service to all my clients, not just in the home sale or purchase process, but for life. I take pride when a past client calls to ask for a recommendation, whether it’s for a handyman or a great restaurant. I have been a top producer since 2003. I am also SFR Certified, which is the only NAR recognized short sale certification. 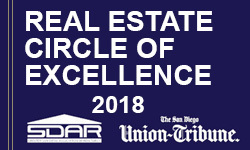 I am also CDPE Certified and a Five Star Award Winner recognized in San Diego Magazine for 4 years. I will earn your trust because I want and appreciate your business.